Posted on July 16, 2014 by revivewa	in News and tagged event, UnitingCare West. 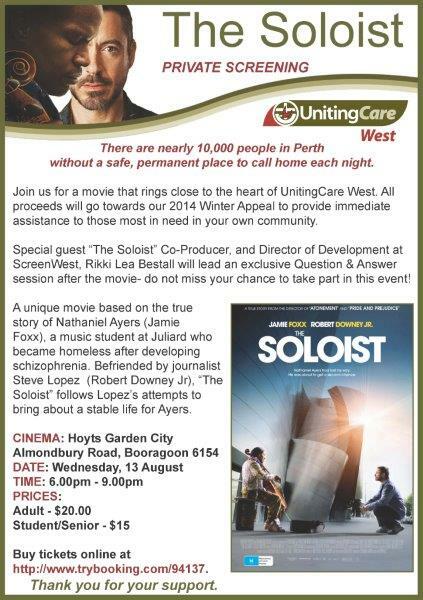 UnitingCare West is hosting a private movie screening to raise funds for their annual Winter Appeal. Join them at Hoyts Garden City in Booragoon to watch The Soloist, and enjoy an exclusive Question and Answer session with the movie’s Co-Producer Rikki Bestall. Tickets are limited and can be purchased online at http://www.trybooking.com/94137 or by calling the Marketing team on 1300 663 298.